Where Do Black-Footed Penguins Live? Black-footed penguins (Spheniscus demersus) are marine birds that are extremely gregarious in nature. Groups of black-footed penguins often consist of upward of 100 specimens. Also known as African penguins, they are noteworthy as being the sole penguin species to reproduce on the African continent. Black-footed penguins live in Africa. 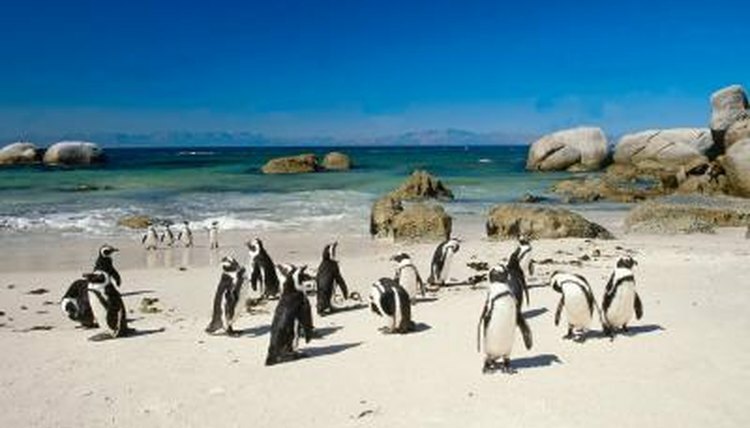 Reproduction of these penguins takes place in its southern regions of South Africa and Namibia, as well as on 25 islands off the coast of these nations. Sightings of them have also occurred in more northerly locations such as Gabon. A few of the specific islands that are home to black-footed penguins are Robben Island, Hollam's Bird Island, Mercury Island and Bird Island. Black-footed penguins differ from many other penguins in that they don't live on the ice. Instead, they inhabit rugged coastal landscapes. When they swim out to sea, they generally don't travel more than 25 miles from land. Black-footed penguins also are often spotted congregating by the water at night. In the daytime, they're generally in the water looking for their next meals. They're highly nimble animals in the water. Numbers of black-footed penguins in their home locales are going down swiftly. The species, as a result, is considered endangered -- reasons for their dwindling numbers include a lack of availability of prey animals, emergence of new predators, egg acquisition by people and deaths due to oil contamination. Their population is in jeopardy to a great extent because of fisheries seizing many of their food staples -- fish. Some of the foods black-footed penguins regularly feast on are herring, anchovies, pilchards and sardines. While they indeed adore tiny fish, they don't eat them exclusively. They also frequently eat crustaceans and squid. Black-footed penguins physically are similar to their near kin, including Humboldt penguins (Spheniscus humboldti). When they're adults, they usually weigh between 7 and 10 pounds. Height-wise, mature specimens are usually between 25 and 27 inches. While the genders look a lot alike, the females are a little smaller than the males. These penguins feature black plumage on their backs and white plumage -- with a few elements of black -- on their stomachs. Immature black-footed penguins start out with bluish-gray feathers, transitioning to black when they're about 3 years of age. Black-footed penguins usually have black feet and limbs. How Do Harp Seals Hear Without Ears? How Do Leopard Seals Kill Their Prey? What are the Characteristics of the Bluegill? What Colors Are Bottlenose Dolphins?